A new paper by a team of researchers led by Karel Matous, College of Engineering Associate Professor of Computational Mechanics in the Department of Aerospace and Mechanical Engineering at the University of Notre Dame, describes how an accurate statistical description of heterogeneous particulate materials, which is used within statistical micromechanics theories, governs the overall thermo-mechanical properties. This detailed statistical description was computed using a novel adaptive interpolation/integration scheme on the nation’s largest parallel supercomputers. Quantifying the morphology of many-body systems has applications in many scientific fields at a variety of length scales from molecular configurations up to structural composites and celestial bodies. 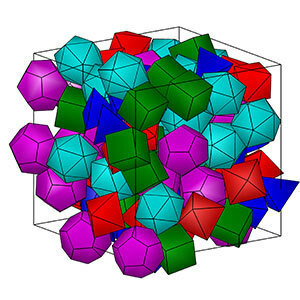 The research is part of the Matous group’s data-driven (image-based) multi-scale modeling strategy, where computations are guided by micro-structural experimental data. “In my research, I study heterogeneous and multifunctional materials in extreme environments by computational and experimental means,” Matous said. “These materials are essential in our daily lives and are utilized in bioengineering, the automotive and aerospace industries, micro-electro-mechanical systems (MEMS) and other applications. Heterogeneous multifunctional materials fill several pivotal roles, including structural support, self-healing capability, power generation and storage, stress mitigation and bio-filtration, just to name a few. Matous notes that the next step in this line of work is to understand the effect of material interfaces and anisotropy (directionally dependent material behavior). The paper appeared as the cover article in the Proceedings of the Royal Society A. Originally published by William G. Gilroy at news.nd.edu on April 17, 2015.